Imagine that President Andrew Jackson, in preparation for a bid to get the Olympics to come to the United States, constructed a museum of Native American cultures. Summoning every hand available, every coolie he can find, he erects a park of 50 hectares. The Summer Olympics of 1840 come and go. Jackson is no longer President (his term having ended in 1837), a Civil War looms, and it will be another 40-60 years before the end of the Indian wars. The park falls into ruin. There is not enough money for programming, except a couple girls dressed in feathers who offer you a slab of buffalo meat, and a few Sioux dancers strutting about in an empty square. Most of the wickiups, wigwams, longhouses, pueblos, and tipis are padlocked shut, but the signage indicates that for a year or two this place was a restaurant serving Inuit whale meat soaked in seal oil and that place was a Mahican grocery; this place was a drum circle with live Lakota drummers and that place was a Three Sisters demonstration project, where kids could plant beans, corn, and squash. Has Andrew Jackson's Injun Park dilapidated because the white people don't like museums about the red people that they are still trying to subdue? Was this a case of bad central planning and the Jackson Administration should have considered what would happen after 1840? Is it sort of a national embarrassment now for people from other countries to visit this place. What do you think they say to each other when they leave? Now, let's go to the China Nationalities Museum and the Chinese Ethnic Culture Park. For 90 RMB, you can enter the northern gate into the North Park and traipse along a cement path with 27 ethnic landscapes and 36 scenic views. Almost the only human contact you have is with a Korean, or somebody pretending to be a Korean. She asks you in Mandarin to take off your shoes to see the exhibit, but you decide not to, because you can see almost everything from where you are standing. You cross over bridges that span the fake river, but these bridges give you the true-to-life feeling that they might collapse and deposit you into the "river" below. The flowers are beautiful, though, because it is Beijing and it is springtime. The most beautiful time of year there. Eventually, you take a pedestrian bridge across the highway--a very special bridge, labeled the National Bridge, to which nearly all signs point--and you enter the South Park with its 30 ethnic landscapes and 24 scenic vistas. You realize that the employment numbers are still probably correct, but the only place you saw any food was in "Inner Mongolia." In "Inner Mongolia", there were five or so brightly-dressed, early 20-something docents sitting around, only one of whom took an interest in you when you stepped into the yurt. She offered you a menu of five different kinds of Mongolian food. You chose the horse milk liquor, which refluxed for the next hour or so, as you continued to trot (and then canter) around the grounds. Tibet had more people than anywhere else. In the shadow of a faux lamasery, people were dancing. Almost all onlookers appeared to be staff or friends/family. In a dimly lit room there was an exquisite exhibit of 80 to 150 lamps spanning more than a thousand years of Chinese history, but who's counting? You wonder where the other 999,850 relics were hiding. Then you remember the big room, called the Main Exhibition Hall. A whole room of trunks. A row of sedan chairs in different styles. "Windmills" for separating the wheat from the chaff. Some of the rooms in this part full of "treasures" were closed, but you could have helped yourself to some of the farm implements. There was one other family there and only a handful of docents. Sign after sign declares, in passable Chinglish, something to the effect of, "These people believe in the primitive religion" or "These people believe in ghosts and gods." 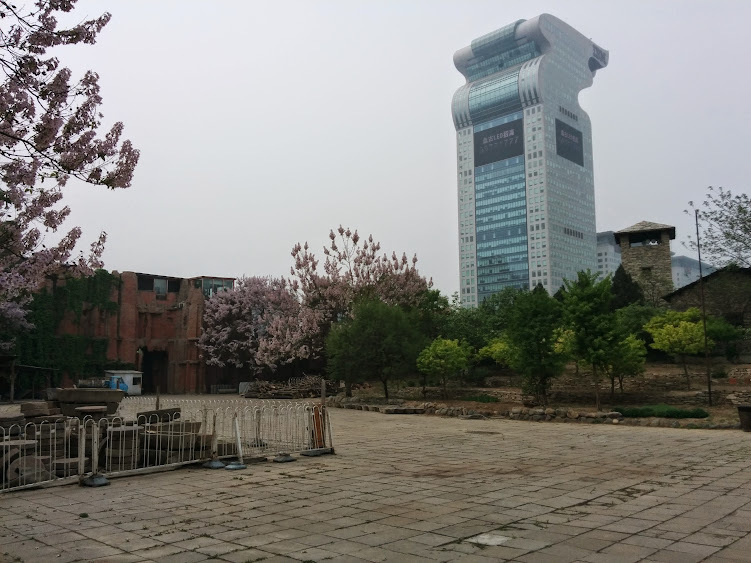 The China Nationalities Museum, as the first project completed in the National Olympic Park, is a crucial venue to honor the spirit of "New Beijing, Great Olympics" and display the theme of "Green, High-tech and People's Olympic Games". ...The museum promotes the new concept of "going into daily life, history, culture and nature', to guide the museum's future development and explore the new way of exhibition. You want to ask: how is that working out? You came to learn about the 少数民族 in Yunnan because you will go there for six days. You come up pretty much empty.